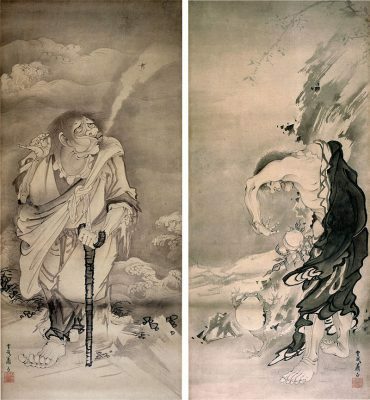 The Japanese artist, Soga Shōhaku (1730-1781), was born into a wealthy household during the Edo Period. Yet, the comfort of wealth was of no solace to this intriguing artist because all members of his immediate family had perished before he reached the tender age of eighteen. Therefore, one can only imagine the impact of death and uncertainty on Shōhaku at such a young age. 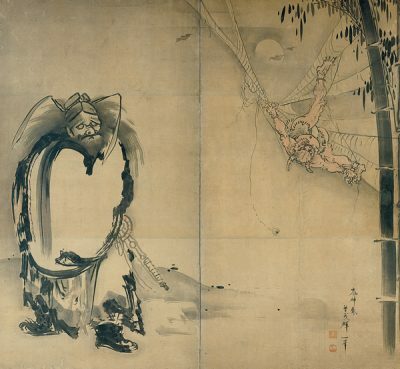 Interestingly, from an artist point of view, it is clear that Shōhaku had an independent sense of belonging. Hence, while the brush style of an earlier Japanese period had become unfashionable, this mattered little to Shōhaku. Given this reality, Shōhaku focused on aspects of the Muromachi Period (approximately 1336-1573) in relation to brush styles. It is known that his unconventional approach to art endeared himself to many during his lifetime – even if questions were raised about other areas of his life. Indeed, Shōhaku was an artistic individual of fresh air based on not fearing to challenge current norms. This artistic approach to art based on being unconventional meant that he wasn’t afraid to go against the grain irrespective if brush styles, artistic concepts that challenged historical subject matters, not fearing being an outsider, and other areas of importance. Like already mentioned, Shōhaku witnessed untold pain and chaos during his early life based on the deaths of all immediate family members. Hence, nonconformity and opposing the constraints of initial classical artistic training may relate to areas of hidden trauma that shaped his response to the artistic norms of his day. Of course, this is debatable but something important shaped the nonconformist approach that he took to art and life in general. Overall, Shōhaku blesses Japanese art based on the intriguing approach that he took to this discipline. Similarly, he wasn’t afraid to focus on brush styles that were perceived to belong to another era in Japanese history.